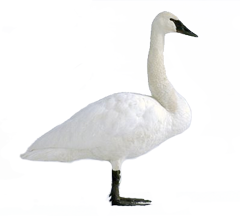 The largest of North American waterfowl, the Trumpeter Swan is resident throughout much of its range, but migratory in other parts. Its was reduced to near extinction by the early 20th century, but it is relatively common today. Trumpeter Swans are very large, all white waterfowl with a long neck, and black bill and face. The bulky body tapers into a slender neck. Trumpeter Swans have been known to live longer than 24 years. These are all-white birds, with a black bill and face. Their legs are black. Juveniles are dirty white all over, with a tinge of gray-pink, turning yellowish gray to dull black. Juveniles bills are gray-black at the base and pink towards the tip, and turns completely black as they mature. Trumpeter Swans forage for submerged and emergent aquatic vegetation, grasses and grains. They form pair bonds when they are three or four years old, and the pair stays together throughout the year, moving together in migratory populations. Trumpeters are assumed to mate for life, but some individuals do switch mates over their lifetimes. Trumpeter Swans breed in freshwater marshes and along ponds and lakes. Their nests are made of aquatic vegetation, grasses and sedges, lined with down and some body feathers, and are usually placed on slightly elevated sites surrounded by water, such as a muskrat mound, beaver lodge or small island. Outside of the breeding season, they spend winters in lakes, streams, springs, rivers and reservoirs. Have you spotted this bird in a particular area? Share you insights and photos in the comments below!